Cardiganshire : Bangor; Bettws Evan; Brongwyn; Henllan; Llandyfriog; Llandyssil (3); Llanfair Orllwyn; Llanfair Treflygon; Llangranog; Llangynllo; Pembryn (2); Troed yr aur (2). Carmarthenshire: Cenarth (2); Llanfihangel ar Arth (2); Llangeler (2); Pemboyr (2). Pembrokeshire: Clyde (2); Llanfrynach; Penrydd. Carmarthenshire and Pembrokeshire: Cilrhedyn (2). The population falling within the Union at the 1831 census had been 19,887 with parishes ranging in size from Henllan (population 122) to Llandyssil (2,724). The average annual poor-rate expenditure for the period 1834-36 had been £ 5,780 or 5s.10d. per head. In June 1837, the Newcastle-in-Emlyn Guardians proposed the construction of a union workhouse to accommodate 150 inmates. On February 26th 1838, the Board unanimously agreed to accept an estimate of £2,750 from Richard Evans for building a workhouse according to the plans and specifications. The building was to be roofed by the 1st September 1839 and completed by Christmas 1839 provided he could start by the 10th day of May. On the 5th May 1838 the Guardians applied for a loan of £3,000 for the purchase of land and building the workhouse, to be paid back in 20 yearly installments of £150. On the 22nd June 1838, the land was purchased from the Rev Augustus Brigstocke for a sum not to exceed £315. The site, commonly called Pantyronnen in Aberarad, was about a mile from Newcastle-in-Emlyn on the north-east side of the Turnpike road to Bwlchydomen (Pantybwlch) in the Parish of Penboyr. The sum of £170 was paid to Mr Thomas Rowlands the architect, for drawings, plans and specifications of the Workhouse and also to superintend the building of the workhouse. Rowlands' design was based on the model cruciform or square plan produced in 1835 for the Poor Law Commissioners. An entrance block at the west contained a board-room, offices etc. To the rear, four accommodation wings radiated from a central supervisory hub where staff could view all the areas of the workhouse. The areas between the wings were divided up to form exercise yards for the different classes of inmate (male/female, infirm/able-bodied etc.). The workhouse location and layout are shown on the 1930s map below. By January 1839, the low buildings were complete bar the roofs. From the architect's report, it appears that someone had forgotten to order the slates which also meant the floors could not be completed. The February architect's report showed that inclement weather had hindered the building of the workhouse but everything that could be done was done. The workhouse, which became known as Foelallt Castle, was completed some time in October 1839. 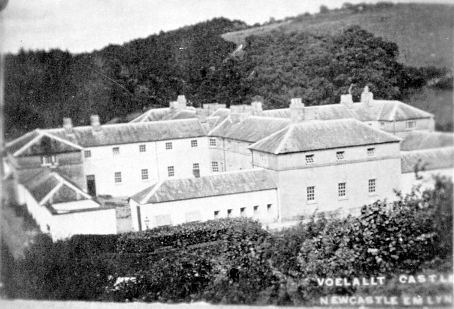 Newcastle-in-Emlyn workhouse from the south-east, 1920s. 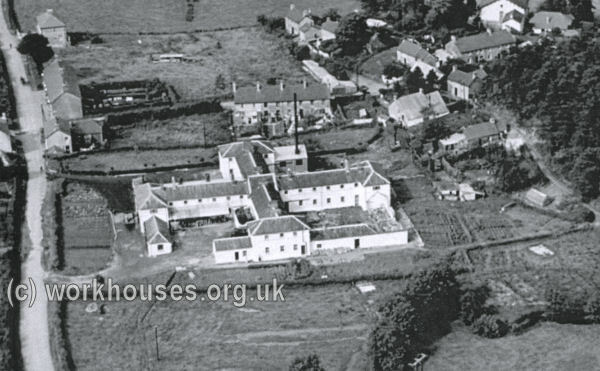 Newcastle-in-Emlyn workhouse from the west, late 1920s. The first Master of the Workhouse was David Davies and his wife Esther was the Matron. The second (and last) Master was Lewis Morgan, and his wife Sarah the Matron. The workhouse never did realise the number of inmates it had been built for, and the number of casual vagrants was always much higher than inmates. The workhouse appears to have closed in about 1916. From 1922 to 1924, the West Wales Farmers Dairy Society rented part of the premises for the production of cheese. In around 1924, part of the building was converted to flats for people awaiting housing in Aberarad, and concerts and Eisteddfodau were organised. 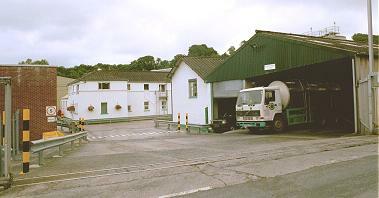 In 1931, the Cow & Gate company took over the premises for the production of dried milk products. They started making cheese in 1934, utilising 500 gallons of milk a day. By the time the company left in 1979, this had risen to 92,000 gallons a day. The Milk Marketing Board then operated a dairy products factory on the site until 1983, after which Mann & Balkham made goats cheese there until 1988. The Dansco (McCaine Foods) company then took over and started making Mozzarella cheese in 1989. Parts of the original building still survive. Ceredigion Archives, Old Town Hall, Queen's Square, Aberystwyth, Ceredigion SY23 2EB. Few local records survive. Holdings include: Guardians' minutes (1837-1930); Financial records (1837-1930); Vaccination registers (1910-30); Relief order books (1910-30). Appreciation to Ken Jones for the picture and information from Guardians' minutes.